We offer any of the class types detailed below upon request. Looking for an entry-point into the kitchen? Kitchen basics is the perfect place to start for a young cook with little to no kitchen experience! 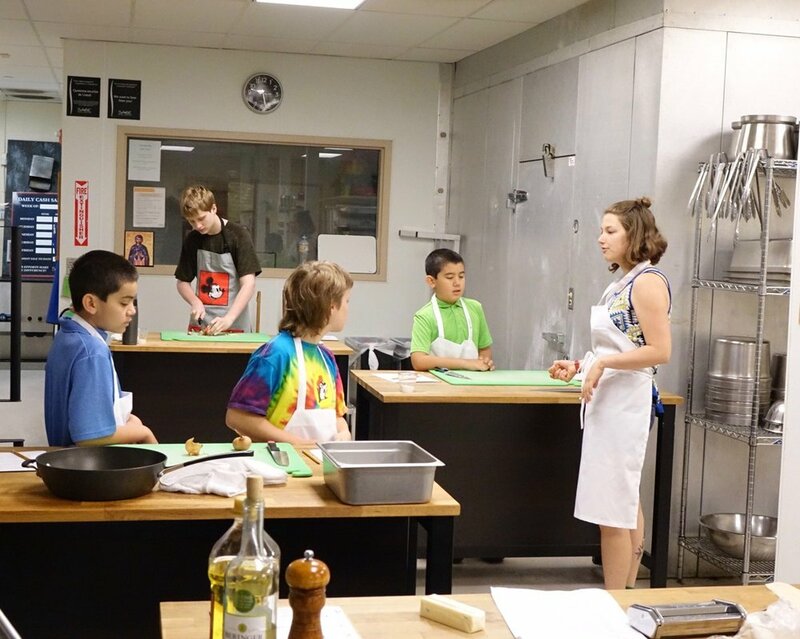 Is your child interested in cooking, but doesn’t know where to start? Let's start here! In this class brisket, dal, risotto, ratatouille, french onion soup, scones, lamb, or pizza may be on the menu! Kitchen for Beginners is the perfect place for a cook with minimal experience in the kitchen, but who has had some exposure to cooking. Is your child comfortable in the kitchen and ready for a new challenge? Recipes such as empanadas, caramel pudding, falafel, gnocchi, stuffed vegetables or meats, or chowder may offer such a challenge. Intermediate Kitchen is the perfect place for young chefs with cooking experience who are looking to take their skills to the next level! This class gives practiced cooks a chance to work independently in an industrial kitchen, with access to a wide variety of ingredients, equipment, and professional guidance. Here, we will explore and perfect recipes such as dumplings, pie crusts, or stuffed homemade pastas! We will also learn the art of making stocks, the five mother sauces and their offshoots, and a variety of techniques. Come put your skills to the test and produce rich, exciting, and show-stopping dishes! Mindfulness: Let's Talk About (and Cook and Eat) Food!